The Elite series has been around for almost 30 years, with the last game having graced our monitors 20-years-ago. 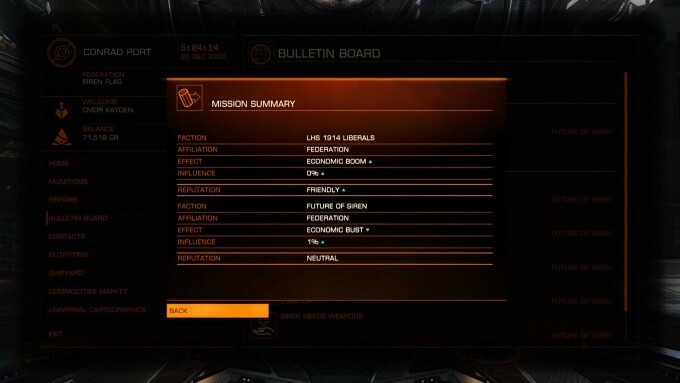 Given that, it’s safe to suspect that Elite Dangerous has a lot to live up to. Does it? Or should we abort this docking? 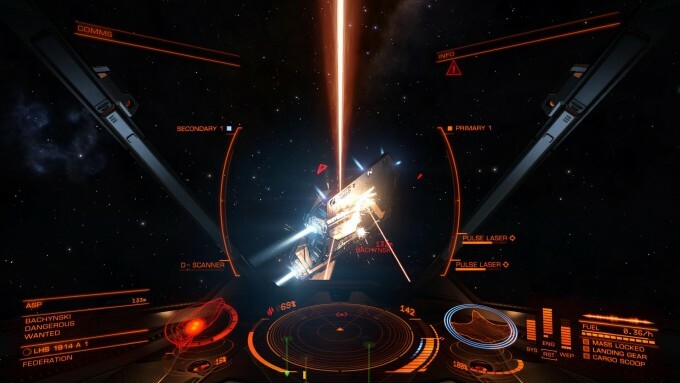 The resurgence of space-based video games have been very popular amongst the crowd funding community, and Elite Dangerous is here because of that communities support. The most famous title of the lot is Star Citizen, raising over $68 Million dollars, and both have been compared to one another time and time again. While the two games occupy the same genre this is not an appropriate comparison. This would be like comparing a smoothie to a beer for nutritional value because both are considered a beverage. There are different goals in place to follow certain gameplay and lore guidelines for what each studio wants to bring in the final product, and both are unique. Both games are going to have a persistent universe that dynamically changes through player’s actions driving the narrative and economics of the game. Star Citizen is being designed to be a story-driven, immersive and realistic experience in almost every way possible, where Elite Dangerous brings more traditional arcade gameplay features from the genre. Neither game will allow players to make quick and dramatic change in the online universe. This may not be something a lot of people will be happy with, but I see this as a good thing. This is because you can help shape an event, like supporting rebels in an area, without having to put in dozens of hours of play time. Unless, of course, there are other players who do not want the rebels to succeed and take missions to stop them. While I embrace this gameplay style, I find the idea to not include a story-telling mechanic very, very boring. I also found that interacting with just text and not building an actual rapport with a human avatar left me emotionally disconnected from the characters’ values and objectives. I just wanted the paycheck to build up my ship, I didn’t care what the mission was for so long as I wasn’t going to get a fine. There is, of course, galactic news, that informs the player to current events but with no background information given about the political and social structure, I again felt disconnected. The best way to understand what has happened in the game’s history is by leaving the game and reading about it. I personally don’t find this sort of thing fun unless I’m personally invested in the story; with no story, I have no ambition to do it. With this lack of story I struggled a bit when I decided I needed to figure out what faction I should ally myself with. This is extremely important because your overall reputation with a faction will determine your access to certain ships, travel to certain solar systems and if you can take part in certain missions in that factions territory. I ended up choosing to side with the Federation because from what I could tell, that faction has the best ships and economic stability to transport varying goods in relatively short distances. The process to earn favor is probably one of the hardest things to do in the game because you have to complete dozens of missions to make any significant headway. This is almost like an MMO so it is to be expected, but the distances you have to traverse are very time consuming. A simple light cargo run can take 5 to 15 minutes and only net you a few hundred to a few thousand credits and little reputation for the effort. This is where that traditional MMO grind kicks in, and it can get worse with different mission types. I don’t want you to think cargo runs are the only way to earn a living. 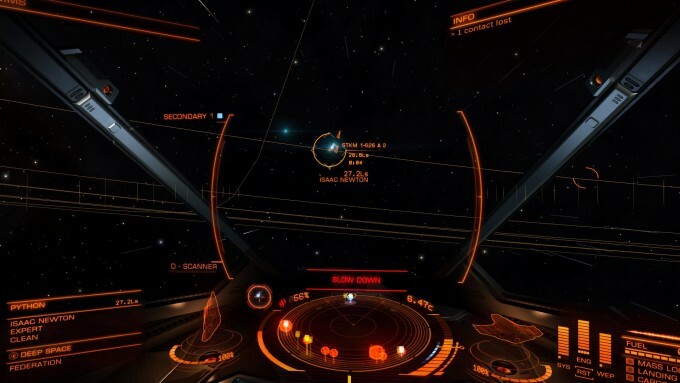 There is bounty hunting, exploring, smuggling, pirating and a host of other things that you can do. There are even special ranks for Trading, Exploring and Combat. Everyone can progress from Harmless to Elite in any legal or illicit way they want. There are boundless opportunities at your disposal with no limits in this Milky Way galaxy comprised of 400 Billion, that’s right Billion, stars. This makes the old “Second star to the right and straight on till morning” saying have more meaning than ever before. With all these options a player is going to run into a combat scenario one way or another. Fortunately there are combat training missions and basic flight training missions available for players to get accustom to some of the basic mechanics of the game. The combat is not only centered around your ship and its equipment but also around how you distribute your ships power. This mechanic could possibly tip the balance of a fight in your favor against the AI because it doesn’t noticeably use this feature. Where it is strongest is with its superior gear, ship and taunting. This combination will make each battle interesting and keep you on your toes. Each ship also has its own unique flight characteristics, which can be personalized based on the equipment you put on it. This can make each encounter, especially against players, a white-knuckle affair. If you ever have to fight all I can say is, may your shields be charged and your kinetic weapons be loaded. The navigation and flight system might seem complex at first, but just like the combat missions, you can partake in basic flight and docking training missions before jumping into the game. Once you have done these missions though, you can go anywhere in the game and use these basic skills to land anywhere. 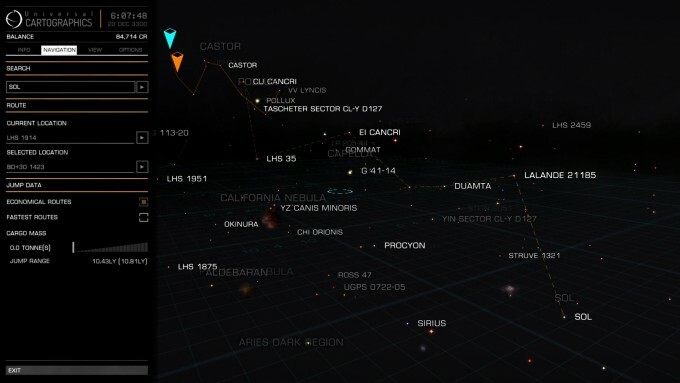 There is even a handy galaxy map that will give you a system by system instruction to get you to your desired location. As someone who took part in the Beta and did not have access to these basic tutorials, I had a steep learning curve. The game is certainly friendlier to newcomers now so I implore you to use these tutorials to better understand the game and save a ton of time. While the navigation and flight system is well thought out, the menu system for buying cargo and parts for your ship is clunky. The mouse can be used to navigate them well enough but there is no instruction on how to understand what a particular symbol means and how you buy cargo, which can be a frustrating affair at first. I would personally like to see at least the shop menu given another pass. 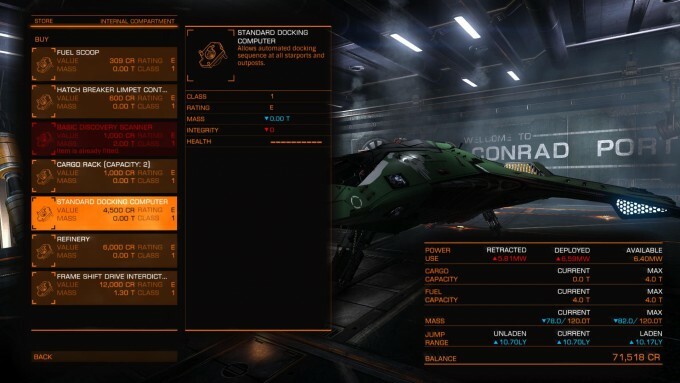 Right now all you have is a + symbol on the right side of the part you want to upgrade or change to indicate that you can buy something at that station, if it isn’t there you have to go somewhere else. I mentioned before that this game requires you to be online but what the game doesn’t require you to do is play with other people. There are solo and open play modes available to everyone. While in either mode the economy and game progression will follow in concert with what is being driven by all players, what you won’t see in solo is any other human players. This limitation also means you cannot play with your friends, which means you have to select open play and interact with everyone, just to see your friends in the great void. The biggest disappointment in Elite Dangerous struck me when I was trying to do something with my brother in-game, where we found out there is no option to team up in any way possible. The only thing you can do is start a call in-game, which has a fantastic voice filter that sounds like you’re far away and on a push-to-talk radio, to one another but that is it. There is no option to team up to get a bounty and claim it together, patrol a section of space from the mission board because the game is currently 100% solo. This infuriating situation for an online game is further compounded by the fact there are no basic trading or personal storage systems in game. Let’s say you want to cheat the system where a friend buys some gold and leave it adrift in space for you to pick up. Everything floating in space that I’ve seen so far, is considered stolen, even if a friend dropped it right in front of you. 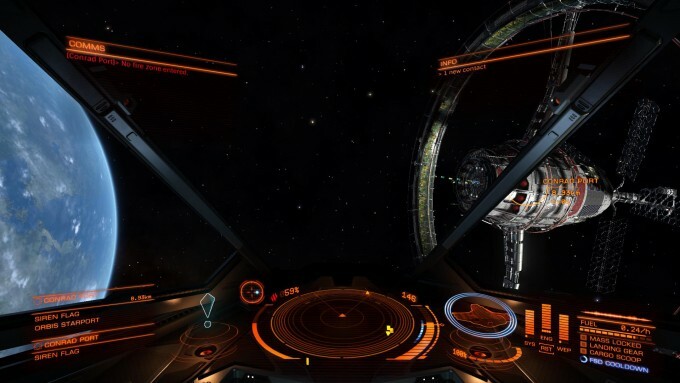 With no right to salvage anywhere you now have to smuggle the gold back into a station, with the possibility of getting fined if you’re successfully scanned by the authorities and then sell it to a black market contact on station, if there is even one on the station. I know lacking a storage system may seem a little nit-picky but consider this: when you find a good part and want to put it in the ship you’re flying and one that you have stored somewhere else, you can’t take it with you or move that ship to you. What you have to do is go get your other ship from another station, go back to that station to pick up the part you want and if you want that first ship back, that’s right, you have to go back to pick it up. This is a gross waste of time. This is even more frustrating when you consider that a person might want to amass a fleet of ships and they can’t even change the name of a single ship. Sure you can see where they are at and what’s on them, but this means you have to waste more time to figure out exactly which one of your ships is your combat Cobra, hauler Cobra or exploration Cobra. Again, a waste of time so there is no incentive to have more than one ship at any given time. These limitations and additional features are currently being worked on but there is no telling when they will be implemented. There are future expansions planned at a cost, but as to which features will be locked into that particular DLC or how much they will be, is unknown at this time. Food for thought: the lifetime pass was going for $50 back in July, which is no longer available, and the game is currently $60, this game could get very expensive. With these myriad problems and concerns, is the game actually fun? That all depends, there were times I found missions no problem and was having a blast, travel time didn’t matter so much. There were other times I spent hours trying to find a mission that paid more than 300 credits and traveling around was boring as hell. A huge factor to this problem is that early on you can’t just change your ship to fit another play style; you have to pick one and go with it. Situations like this was the reason why I didn’t play this game in long intervals. It just got too boring in-between good missions and trying to get simple tasks done. An inventory system is basic, moving a ship is basic and etc. With these features missing the game felt more like a burden than an enjoyable experience from time to time. With as much time you spend in the void, you will come to appreciate the graphics. The skins are especially impressive on ships, but because they are cosmetic, they don’t serve any real purpose and only players have them. I recommend not buying any from the online store because no one will really see them until you can form groups. What will blow your mind is the amount of detail they put into each star system. The game has a true 1:1 ratio no matter where you look so if you go to a planet like Saturn, each and every one of those asteroids is individually rendered. The star effects, a planet’s atmosphere and stations are also very well done. I never saw something that was overly sub-standard here. The game supports TrackIR, Multi-Monitor and Oculus Rift which is no small feat. The Oculus Rift doesn’t officially support Dev Kit 2 yet but it can be forced to work if you install a workaround. 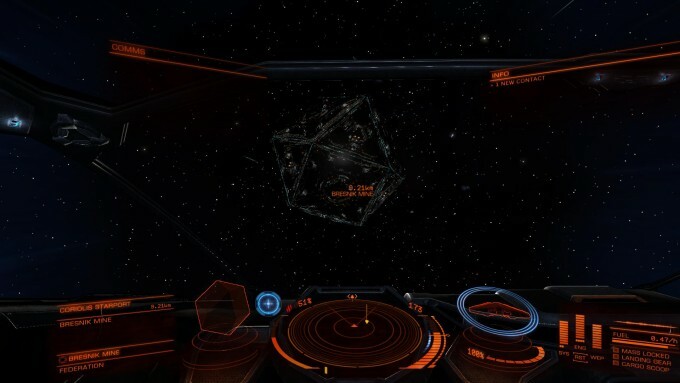 The only graphical disappointment came in the damage states of the ships. The ships are very simple and blow up as a unit which is a little disappointing. In comparison, Star Citizen’s ships have pieces that will fly off and this will affect the flight characteristics of the ship. This wasn’t something I thought I would notice too much but I did. While it isn’t bad, it shows just how different the games actually are. The sound is phenomenal in this game. The music is well-composed and provides a player a good sense of either combat or free flight but it’s almost transparent when it plays so when it stops, you notice and miss it a little more each time it does stop. With no story there is very little voice acting but the ship interactive system is well spoken and mixed well to sound like a computer without being annoying, great work here. The stations have varying voice work done and they all sound like genuine announcements at an airport or something. The online infrastructure is very solid for a central server based in the UK. There were a few problems with the mission bulletin board system at launch but it was quickly sorted. No other major incidents, including server downtime or constant disconnects, occurred during the course of my review. 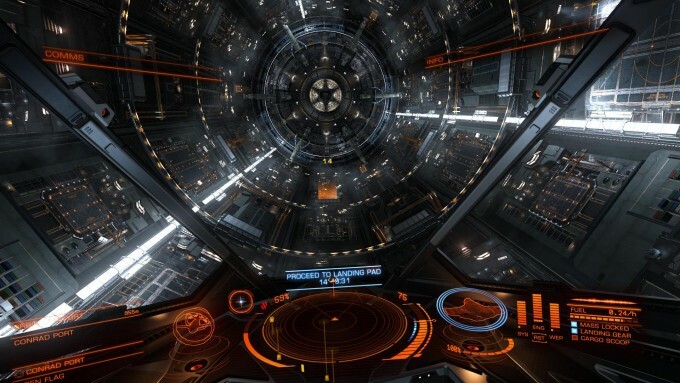 In the end, Elite Dangerous is not as stellar as it should have been for a final release. I do consider this game to be fun as a solo experience and the road map from the Frontier devs helps illustrate and build confidence that this could be a better game. However, I can’t justify recommending this game to anyone who isn’t itching to get into the void, is willing to overlook a slew of missing features and go solo, including with a ship. I think it’s best to just let this game cruise along for a little while longer before jumping into the pilot seat. No Backstory or Comprehensive Narrative Given. A Solo Experience in a MMO Universe. A Host of Basic Features Missing. Multiple Costly DLC on the Horizon.